Baber, Adin, Nancy Hanks: the Destined Mother of a President, (Kansas, Ill.: Private printing, 1963). Barnhart, John D., The Impact of the Civil War on Indiana, (Indiana Civil War Centennial Commission,1962). Barringer, Graham, The Life and Letters of Henry S. Lane, (Ph.D. dissertation, University of Indiana, 1927). Bigham, Darrel E., The Abraham Lincoln Collections at the Indiana Historical Society, (Indiana Magazine of History, March 2005). Coleman, Charles, The Half-Faced Camp in Indiana - Fact or Myth?, (Abraham Lincoln Quarterly, September 1952). Colfax, Schuyler, Life and Principles of Abraham Lincoln, (J. B. Rodgers, printer, 1865). Foulke, William, Life of Oliver P. Morton, Volumes I and II. French, William, Speeches, State Papers and Public Services of Governor Oliver P. Morton, (1864). Glen, John M.; Towne, Stephen E.; Tuner, Nancy K.; Rodgers, Thomas E.; and Taylor, Saundra B., Indiana Archives: Indiana in the Civil War Era, (Indiana Magazine of History, September 1996). Goodrich, DeWitt C.; and Tuttle, Charles Richard, History of the State of Indiana, (Richard S. Peale,1879). Gray, Ralph D., Thomas A. Hendricks: Spokesman for the Democracy, (Gentlemen from Indiana: National Party Candidates, 1836-1940, pp. 117-139, (Indiana Historical Bureau, 1977). Gray, Wood, The Hidden Civil War: The Story of the Copperheads, (1942). Julian, George Washington, Political Recollections, 1840 to 1872, (Jansen, McClurg and Co., 1884). Julian, George Washington, George W. Julian's Journal, (Indiana Magazine of History, December 1915). Kenworthy, Leonard, The Tall Sycamore of the Wabash, Daniel Voorhees, (B. Humphries, 1936). McMurtry, Gerald, The Lincoln Migration from Kentucky to Indiana, (Indiana Magazine of History, December 1937). Richardson, Elmo; Farley, Alan W., John Palmer Usher: Lincoln's Secretary of the Interior, (University of Kansas, 1960). Riddleberger, Patrick W., George Washington Julian, Radical Republican, (Indiana Historical Bureau, 1966). Schell, Herbert S., Hugh McCulloch and the Treasury Department, 1865-1869, (The Mississippi Valley Historical Review, December 1930). Seeds, Russell, History of the Republican Party of Indiana, (Volume I (1899)). Sharp, Walter, Henry S. Lane and the Formation of the Republican Party in Indiana, (Mississippi Valley Historical Review, September 1920: pp. 93-112). Smith, Willard, Schuyler Colfax: The Changing Fortunes of a Political Idol, (Indiana Historical Bureau, 1952). Stampp, Kenneth, Indiana Politics During the Civil War, (Indiana Historical Bureau, 1949). Stewart, James Brewer, Joshua R. Giddings and the Tactics of Radical Politics, (Press of Case Western Reserve University 1970). Sulgrove, B. R., John D. Defrees, (Indiana Magazine of History, Volume II). Terrell, W. H. H., Indiana in the War of the Rebellion, (Douglass & Conner, 1869). The Indiana Election, (Lincoln Lore, 1973). Thornbrough, Emma, Indiana in the Civil War Era, 1850-1880, (Indiana Historical Bureau and Indiana Historical Society, 1965). Warren, Louis A., Lincoln's Youth: Indiana Years, Seven to Twenty-One, 1816-1830, (Indiana University Press, 2002). Warren, Louis A., The Environs of Lincoln's Youth, (Lincoln Centennial Association Papers, 1932). Wernle, Robert F., Henry Smith Lane, the Old War-Horse, (Montgomery County Historical Society, 1938). Harbison, Winfred, Indiana Republicans and the Re-Election of President Lincoln, (Indiana Magazine of History). Harbison, Winfred A., Indiana Republicans and the Re-Election of President Lincoln, (Indiana Magazine of History, September 1937). Hesseltine, William, Lincoln and the War Governors. Hesseltine, William, Lincoln's War Governors, (Abraham Lincoln Quarterly, December 1946). Holcombe, John, Life and Public Services of Thomas A. Hendricks, (1886). The Indiana State Debt and Governor Oliver P. Morton: The Ablest and Most Energetic of the War Governors, The Indiana State Debt and Governor Oliver P. Morton: The Ablest and Most Energetic of the War Governors, (Lincoln Lore, May 1988). Klement, Frank, The Copperheads of the Middle West, (University of Chicago Press, 1960). Lincoln's Hoosier Background,(Lincoln Lore, November 11, 1940). Abraham Lincoln grew up in Indiana. Indiana was the state of his formation as an adolescent and it was a state that helped form his political future in 1860 when Indiana Republicans teamed with Republicans from Illinois to engineer his nomination for President. Mr. Lincoln stayed away from the state for a dozen years until he returned to Indiana in late October 1844. As a Whig politician he gave campaign speeches in Bruceville, Vincennes, and Washington and reconnected with his childhood roots. As a member of Congress from 1847 to 1848, Mr. Lincoln undoubtedly traveled through Indiana on his way to and from Washington. Thomas H. Nelson lost his race for an Indiana congressional seat in 1860 but was appointed as Minister to Chile by President Lincoln. Nelson recalled: “Judge Abram Hammond, afterwards Governor of Indiana, and myself arranged to go from Terre Haute to Indianapolis in a stage-coach. As we stepped in we discovered that the entire back seat was occupied by a long, lank individual, whose head seemed to protrude from one end of the coach and his feet from the other. He was the sole occupant, and was sleeping soundly. Hammond slapped him familiarly on the shoulder, and asked him if he had chartered the coach that day. “Certainly not,” and he at once took the front seat, politely giving us the place of honor and comfort. An odd-looking fellow he was, with a twenty-five cent hat, without vest or cravat. Regarding him as a good subject for merriment, we perpetrated several jokes. He took them all with utmost innocence and good nature, and joined in the laugh, although at his own expense. I much regret not seeing you while you were here among us. Before learning that you were to be at Jacksonville on the 4th I had given my word to be at another place. Besides a strong desire to make your personal acquaintance, I was anxious to speak with you on politics, a little more fully than I can well do in a letter. My main object in such conversation would be to hedge against divisions in the Republican ranks generally, and particularly for the contest of 1860. The point of danger is the temptation in different localities to ‘platform’ for something which will be popular just there, but which, nevertheless, will be a firebrand elsewhere, and especially in a National convention. As instances, the movement against foreigners in Massachusetts; in New-Hampshire, to make obedience to the Fugitive Slave law, punishable as a crime; in Ohio, to repeal the Fugitive Slave law; and squatter sovereignty in Kansas. In these things there is explosive matter enough to blow up half dozen national conventions, if it gets into them; and what gets very rife outside of conventions is very likely to find its way into them. What is desirable, if possible, is that in every local convocation of Republicans, a point should be made to avoid everything which will distract republicans elsewhere. Massachusetts republicans should have looked beyond their noses; and then they could not have failed to see that tilting against foreigners would ruin us in the whole North-West, New-Hampshire and Ohio should forbear tilting against the Fugitive Slave law in such way as [to] utterly overwhelm us in Illinois with the charge of enmity to the constitution itself. Kansas, in her confidence that she can be saved to freedom on ‘squatter sovereignty’ — ought not to forget that to prevent the spread and nationalization of slavery is a national concern, and must be attended to by the nation. In a word, in every locality we should look beyond our noses; and at least say nothing on points where it is probably we shall disagree. 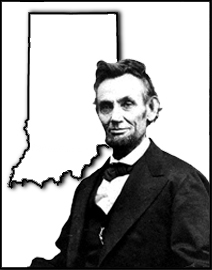 Mr. Lincoln’s visit to Indianapolis, though short, helped set the stage for collaboration between Indiana and Illinois at the Republican National Convention in Chicago in May 1860. Indiana would play an instrumental role in the nomination of Mr. Lincoln in 1680. Illinois’s delegation was relatively small. Although the entire slate was pledged to back Mr. Lincoln, the Illinois delegation included some delegates who actually favored other candidates. Neighboring Indiana had a larger delegation. Together with Illinois, Indiana would cast a block of 48 votes. Together, Mr. Lincoln’s backers chipped away at delegates in New England that William H. Seward’s supporters thought would go to the New York Senator. Indiana Republicans expected to be rewarded with a Cabinet position — the first for the state in American history. So as President-elect Lincoln assembled his Cabinet, the claims of Indiana trumped even those of Illinois Republican State Chairman Norman B. Judd, who expected to be named Secretary of the Interior. Instead, Mr. Lincoln’s options for that spot narrowed to attorney Caleb Smith and Congressman Schuyler Colfax. Smith had seconded the nomination of Lincoln, while Schuyler Colfax had supported Edward Bates before the 1860 Republican National Convention and sought unsuccessfully to deliver Indiana’s delegates to Bates. Indiana was the first state stop on President Lincoln’s 12-day trip to Washington for his inauguration. At Thorntown Indiana, President-elect Lincoln set the tone for his pre-inaugural trip to Washington: “He had heard of a man who was a candidate for a county office, who owned a horse that he set great store by, but he was a slow animal and sure footed. He had canvassed extensively with a good chance for the nomination. On the morning of the day of the convention, he mounted his favorite to go to the county seat, but in spite of whip and spur, his horse lagged on the road, biting at every bush, and when he arrived late in the evening, the convention was over and he was defeated. So of him, if he stopped at every station to make a stump speech he would not arrive at Washington until the inauguration was over.” 25 The entourage overnighted in Indianapolis. Mr. Lincoln’s first night on the road to Washington demonstrated that better planning and tighter security would be needed. More people than expected wanted to hear and touch the President elect. Journalist Henry Villard wrote “So little attention was paid in the supper room to the President elect that he was obliged to wait nearly half an hour for his slender share of the repast….”31 That night, several thousand Indianans stood in line to shake Mr. Lincoln’s hand. The whole day and night were exhausting. Scholar Winfred A. Harbison wrote: “Although the Democrats condemned his declaration, that the Union must be defended at all costs, as provocative of war, the Republican papers defended his position as nothing less than his duty and expressed ‘the utmost confidence in Mr. Lincoln’s ability and patriotism.” 32 Mr. Lincoln finished his in a reception back at Bates House, where several thousand people sought to meet him. On the morning of his birthday the next day, Mr. Lincoln met with state legislators at the State Capitol before leaving Indianapolis for Cincinnati. Two weeks before Smith left office, Mr. Lincoln chose Usher to replace him. There was Senate opposition to Usher’s nomination which the state’s two senators did their best to overcome. Usher had already been doing much of Smith’s work so his appointment was logical. Presidential aide William O. Stoddard, moonlighting as a journalist, wrote: “The appointment of Mr. Usher, as Secretary of the Interior, seems to meet with pretty general approval, at least among those who known him, but he has never had anything like a national reputation, and there are those who blame the President for passing by so many who have. The fact that he has never been a politician, however, ought certainly not to be counted against him. The fact is, by the way, if this nation is really dying, it is dying of its politicians, and nothing else. Dying of the consequences of their mismanagement, past and present, and of the sad results of their insane ambition.” 36 Stoddard added: “There are several minor, but still important posts, in connection with the Cabinet, yet to be filled. The Assistant-Secretary of the Interior, in place of the present incumbent, who is a son of ex-Secretary Smith will probably be first attended to. This office, though a new creation, is fast growing into one of great importance, and if the proposed policy with reference to our armies is to be carried out, will require a man of talent and industry. 37 Another Republican Hoosier attorney and friend of President Lincoln, Judge William T. Otto, was named to the assistant secretary post. He had chaired the Indiana delegation to the 1860 Republican National Convention and strongly advocated Smith’s nomination to the Cabinet. When House Speaker Galusha Grow of Pennsylvania was defeated for reelection in 1862, Colfax entered the race to succeed him. Colfax himself had barely survived his Democratic challenge and urgently requested that President Lincoln appoint one of his chief political allies to office: “If you can do this you would enable me to pay a heavy debt of gratitude — promote a worthy man — and place under life long obligations to you,” wrote Colfax to the President. 40 The smiling Colfax was a good politician but not necessarily a reliable one. In the Speaker contest, Colfax defeated a Missouri Republican, General Frank Blair Jr., a more conservative option. Lane biographer Robert F. Wernle that “Lane had a happy facility for extemporaneous humor. That day that he was giving one of his stump speeches, an item appeared in the newspaper stating that the house of Stephen A. Douglas had been hit by lightning, but fortunately the judge was not at home. Lane [quipped] that ‘the lightning was feeling for him, but did not find him.” 62 Indiana was a swing state and Republicans concentrated on swinging German-Americans to the Republican ticket. Lane’s victory in October when the state held its non-presidential elections was a positive harbinger of Mr. Lincoln’s presidential victory in November. He defeated Thomas A. Hendricks, an attorney and former congressman who had headed the General Land Office, a federal post Mr. Lincoln himself had sought in 1849. Republicans continued their 7-4 control of the state’s congressional delegation. According to Morton biographer William Dudley Fouke, the Democratic legislators “would make no appropriations except at the price of a military bill depriving Morton of all control of the forces of the state. Under no circumstances would he consider this alternative …When the legislature adjourned the Democrats did not doubt that they could force him into submission. They did not believe he could carry on the government for ten days without an appropriation …But Morton had resources upon which they had not reckoned. In the first place, a large sum had been made by the profitable management of the state arsenal.” 85 Over Democratic opposition, Morton dedicated these funds to state expenditures and gathered other private and governmental funds to supplement it. Democrats threatened prosecution under state laws against embezzlement of state funds. They took him into court to force him to call the Legislature into special session. Despite this help, Governor Morton was not necessarily friendly to the reelection of the President. Historian Winfred A. Harbison wrote: “In Indiana the Republicans or Unionists were divided roughly into three classes in respect to their attitude towards the question of renomination. By far the largest class comprised those who believed that ‘Old Abe’ was, all things considered, the best man to complete ‘the great task remaining before us’. Soon after the elections of 1863 it became evident that the popular confidence in the President was increasingly rapidly, and that many people were coming to believe that he must be continued for another term.”90 Many Indiana editors began to endorse President Lincoln for reelection. Presidential patronage appointees took a strong role in assuring President Lincoln’s endorsement for reelection in 1864. John G. Nicolay wrote in mid-February: “Things have been drifting along chaotically for two or three weeks, but active work must begin soon[.] Defrees has gone to Indiana to look after matters there, and we shall probably have a good endorsement there. Corruption and malice are doing their worst, but I do no think it is in the cards to beat the Tycoon.”92 Provost Marshal Richard W. Thompson, an erstwhile colleague of Congressman Lincoln, and John Defrees, the Superintendent of Public Printing, were among several Republican patronage appointees to help organize the convention on President Lincoln’s behalf. With their triumph in the state elections, Indiana Republicans felt confident for the national election in November. Foulke wrote that “Morton felt so secure that he found time to go to other states to aid the Republicans. He visited New York New Jersey and Pennsylvania, speaking in many places at the solicitation of the Republican National Committee. On the 2th of October he delivered an address at the Cooper Institute, in which he considered the fatal consequences which would follow the policy recommended in the peace resolution of the Chicago convention.” 104 On election night at the White House, noted journalist Noah Brooks, “The first gun came from Indiana, Indianapolis sending word about half-past six in the evening that a gain of fifteen hundred in that city had been made for Lincoln.” 105 When the votes were counted in Indiana, President Lincoln received 54% of Indiana’s votes. After the 1864 election, Mr. Lincoln needed to make a cabinet shakeup in order to accommodate pressure from Methodists who wanted a member of their denomination in the Executive branch. Former congressman William Mitchell wrote President Lincoln a note of caution: “Our state is a peculiar state and the Political Eliments [sic] are in rather a revolutionary state and it requires a ste[a]dy hand to carry us through and solidify our party in others words we want political piece [sic] and as our Best Politicians say let well a nough a lone as far as Indiana is conserned [sci] in the Cabinet– its no time now to swap horses.” 106 Nevertheless, Mr. Lincoln decided to replace Indiana’s John P. Usher with Iowa Senator John Harlan in the Interior Department — largely to make northern Methodists happy. But another vacancy opened up at Treasury when William Pitt Fessenden resigned to return to the Senate. In Fessenden’s place, President Lincoln put Indiana’s Hugh McCullough, who had served as Comptroller of the Currency, running the Currency Bureau and the bank system. Roy P. Basler, editor, Collected Works of Abraham Lincoln, Letter from Abraham Lincoln to Schuyler Colfax, July 6, 1859, Volume III, p. 390-391. Roy P. Basler, editor, Collected Works of Abraham Lincoln, Speech at Indianapolis, Indiana, September 19, 1859 – Indianapolis Atlas, September 20, 1859, Volume III, pp. 463-470. Allen Thorndike Rice, Reminiscences of Abraham Lincoln, p. 414. Emma Lou Thornbrough, Indiana in the Civil War Era, 1850-1880, p. 87. Paul M. Angle and Earl Schenck Miers, editors, Fire the Salute: Murat Halstead Report the Republican National Convention in Chicago, May 16, 17, & 186, 1860, p. 34. Paul M. Angle and Earl Schenck Miers, editors, Fire the Salute: Murat Halstead Report the Republican National Convention in Chicago, p. 32-34. Alexander K. McClure, Lincoln and Men of War-Times, p. 35-36. Melvin L. Hayes, “Mr. Lincoln Runs for President,” Daily Republican (Springfield, Massachusetts), p. 62. Emma Lou Thornbrough, Indiana in the Civil War Era, 1850-1880, p. 96. Ray P. Basler, editor, Collected Works of Abraham Lincoln, Letter from Abraham Lincoln to Schuyler Colfax, March 8, 1861, Volume IV, p. 278. Harry J. Carman and Reinhard H. Luthin, Lincoln Forms His Cabinet, p. 137. Doris Kearns Goodwin, Team of Rivals: The Political Genius of Abraham Lincoln, p. 129. Jesse W. Weik, The Real Lincoln: A Portrait, p. 294. Roy P. Basler, editor, Collected works of Abraham Lincoln, Excerpt of Remarks at Thorntown and Lebanon, Indiana, February 11, 1861, Volume IV, p. 193. Victor Searcher, Lincoln’s Journey to Greatness, p. 24. Victor Searcher, Lincoln’s Journey to Greatness, p. 26. William E. Barringer, House Dividing: Lincoln as President Elect, p. 270. Roy P. Basler, editor, Collected Works of Abraham Lincoln, Excerpt of Remarks at Indianapolis, Indiana, February 11, 1861, Volume IV, p. 193-94. Roy P. Basler, editor, Collected Works of Abraham Lincoln, Excerpt of Remarks at Indianapolis, Indiana, February 11, 1861, Volume IV, p. 195-96. William E. Barringer, House Dividing: Lincoln as President Elect, p. 271. Winfred A. Harbison, “Lincoln and Indiana Republicans, 1861-1862,”, Indiana Magazine of History, September 1937, p. 279. Elmo R. Richardson and Alan W. Farley, John Palmer Usher, Lincoln’s Secretary of the Interior, p. 18. Elmo R. Richardson and Alan W. Farley, John Palmer Usher, Lincoln’s Secretary of the Interior, pp. 28-29. Journalism of Presidential Secretary William O. Stoddard, January 5, 1863, p. 133. Michael Burlingame, editor, At Lincoln’s Side: John Hay’s Civil War Correspondence and Selected Writings, Washington Chronicle, August 20, 1863, p.236. Michael Burlingame, editor, At Lincoln’s Side: John Hay’s Civil War Correspondence and Selected Writings, Letter from John Hay to Schuyler Colfax, August 20, 1863, p. 52. Gideon Welles, Diary of Gideon Welles, May 3, 1863, Volume I, p. 484. Willard H. Smith, Schuyler Colfax: The Changing Fortunes of a Political Idol, p. 190. Noah Brooks, Washington in Lincoln’s Time, pp. 30-31. George W. Julian, Political Recollections, 1840 to 1862, p. 372. Richard N. Current, The Lincoln Nobody Knows, p. 164. Noah Brooks, Mr. Lincoln’s Washington, February 15, 1863, p. 108. Josiah B. Grinnell, Men and Events of Forty Years, p. 139. George H. Mayer, The Republican Party, 1854-1964, p. 111. Francis B. Carpenter, The Inner Life of Abraham Lincoln: Six Months at the White House, p. 177. Allen Thorndike Rice, Reminiscences of Abraham Lincoln by Distinguished Men of His Time, pp.47-49. George W. Julian, Political Recollections, 1840 to 1862, pp. 182-183. George W. Julian, Political Recollections, 1840 to 1862, p. 218. Carl Sandburg, Abraham Lincoln: The War Years, Volume IV, p. 58. Carl Sandburg, Abraham Lincoln: The War Years, Volume IV, p. 59. Josiah B. Grinnell, Men and Events of Forty Years, p.81. William B. Hesseltine, Lincoln and the War Governors, p. 86. William Dudley Foulke, Life of Oliver P. Morton, Volume I, p. 66-67. George W. Julian, Political Recollections, 1840 to 1862, p.357. Allen Thorndike Rice, editor, Reminiscences of Abraham Lincoln, p. 355. Robert F. Wernle, Henry Smith Lane: The Old War-House, p. 49. Robert F. Wernle, Henry Smith Lane: The Old War-House, p. 57. Robert F. Wernle, Henry Smith Lane: The Old War-House, p. 50. Bruce Tap, Over Lincoln’s Shoulder, p. 123. John D. Barhart, The Impact of the Civil War on Indiana, p. 3. Winfred A. Harbison, “Lincoln and Indiana Republicans, 1861-1862”, Indiana Magazine of History, September 1937, p. 282. Ward Hill Lamon, Recollections of Abraham Lincoln, 1847-1865 (Letter from John Palmer Usher to Ward Hill Lamon), April 19, 1861, p. 320-321. Ward Hill Lamon, Recollections of Abraham Lincoln, 1847-1865, Letter from John Palmer Usher to Ward Hill Lamon, May 5, 1861, p. 322. William B. Hesseltine, Lincoln and the War Governors, p. 42. George W. Julian, Political Recollections, 1840 to 1862, p. 272. Emma Lou Thornbrough, Indiana in the Civil War Era, 1850-1880, p.109. Allan Nevins, The War for the Union: The Improved War, 1861-1862, p. 347. Roy P. Basler, Collected Works of Abraham Lincoln, Letter from Abraham Lincoln to Oliver P. Morton, September 29, 1861, Volume IV, pp. 541-542. Ward Hill Lamon, Recollections of Abraham Lincoln 1847-1865, p. 141. Winfred A. Harbison, “Indiana Republicans and the Re-election of President Lincoln”, Indiana Magazine of History, March 1938, p. 42. Kenneth Stampp, Indiana Politics During the Civil War Era, p. 151. Winfred A. Harbison, “Lincoln and Indiana Republicans, 1861-1862”, Indiana Magazine of History, September 1937, p. 302. William Dudley Foulke, Life of Oliver P. Morton, Volume I, p. 254. Roy P. Basler, Collected Works of Abraham Lincoln, Letter from Abraham Lincoln to Oliver P. Morton, Volume VI, pp. 87-88. William Dudley Foulke, Life of Oliver P. Morton, Volume I, p.260. William B. Hesseltine, “Lincoln’s War Governors” , Abraham Lincoln Quarterly, Volume IV, No. 4, December 1946, p. 192. Winfred A. Harbison, “Indiana Republicans and the Re-election of President Lincoln” , Indiana Magazine of History, March 1938, p. 47. George W. Julian, Political Recollections, 1840 to 1862, p. 237. Michael Burlingame, editor, With Lincoln in the White House: Letters, Memoranda, and Other Writings of John G. Nicolay, 1860-1865 (Letter from John G. Nicolay to John Hay), February 17, 1864, p. 127. Winfred A. Harbison, “Indiana Republicans and the Re-election of President Lincoln,” Indiana Magazine of History, March 1938, p. 53. Harry J. Carman and Reinhard H. Luthin, Lincoln and the Patronage (Letter from B. F. Tuttle to Salmon P. Chase), February 24, 1864, p. 254. Winfred A. Harbison, “Indiana Republicans and the Re-election of President Lincoln”, Indiana Magazine of History, March 1938, p. 54. Kenneth Stampp, Indiana Politics During the Civil War Era, p. 223. William Dudley Foulke, Collected Works of Abraham Lincoln, Letter from Henry J. Raymond to Abraham Lincoln, August 22, 1864, Volume VII, p. 518. Charles M. Walker, Sketch of the Life, Character and Public Services of Oliver P. Morton, p. 106-107. William Dudley Foulke, Life of Oliver P. Morton, Volume I, p. 366. Roy P. Basler, Collected Works of Abraham Lincoln, Letter from Abraham Lincoln to William T. Sherman, September 19, 1864, Volume VIII, p. 11. Ward Hill Lamon, Recollections of Abraham Lincoln, pp.280-281. Roy P. Basler, Collected Works of Abraham Lincoln, Speech to One Hundred Fortieth Indiana Regiment, March 17, 1865, Volume VIII, pp.360-62. Alexander K. McClure, Lincoln’s Own Yarns and Stories, pp.266-267. Alexander K. McClure, Lincoln and Men of War-Times, “Letter from Mrs. Henry S. Lane to Alexander K. McClure”, September 16, 1891, p. 31. Alexander K. McClure, Lincoln and Men of War-Times, pp. 32-34. Harry E. Pratt, David Davis, 1815-1886, p. 82. Alexander K. McClure, Lincoln and Men of War-Times, p. 93. Winfred A. Harbison, “Indiana Republicans and the Re-election of President Lincoln” , Indiana Magazine of History, March 1938, p.61. Michael Burlingame , editor, With Lincoln in the White House: Letters, Memoranda, and Other Writings of John G. Nicolay, 1860-1865 (Letter to Therena Bates), October 2, 1864, p. 161-62. Harry J. Carman and Reinhard H. Luthin, Lincoln Forms His Cabinet, p. 138. Michael Burlingame, editor, Dispatches from Lincoln’s White House: The Anonymous Civil War Journalism of Presidential Secretary William O. Stoddard, January 5, 1863, p. 133. Benjamin Brown French, Witness to the Young Republic: A Yankee’s Journal, 1828-1870, July 5, 1863, p. 425. Noah Brooks, Washington in Lincoln’s Time, p. 30. William Dudley Foulke, Life of Oliver P. Morton, Volume I, p. 371. Noah Brooks, Lincoln Observed, November 11, 1864, pp. 143-44. Roy P. Basler, editor, Collected Works of Abraham Lincoln, Letter from Abraham Lincoln to Schuyler Colfax, July 6, 1859, pp.390-391.